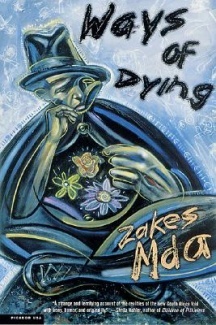 Ways of Dying by Zakes Mda, is a brilliant book. I hope I can do it justice here. The novel is set in an unnamed city in the dying days of South Africa under apartheid, between the release of Nelson Mandela from Robben Island and the relaxation of bans on Black political parties in 1990, and the democratic vote which brought Black majority rule in 1994. This traumatic transitional period was marked by violence which shocked the world community. The violence was inflicted by White supremacists determined to hang onto power; by tribal rivals competing for political influence; and by a still intransigent government which while publicly negotiating reform was behind the scenes provoking violence in order to show that the Black majority was too divided to assume power. Endemic Black poverty was made worse by political strategies on all sides: while the government continued to bulldoze shanty-towns to bully people away from city areas reserved for Whites, Black South Africans exercised the only political power they had, using their industrial might to impact the economy with strikes and stayaways – which worsened their own unemployment and hardship. Appropriately, Mda tells his tale using the oral storytelling tradition of Black South Africa. For generations the voices of Black Africa were silenced because they were denied access to education and their stories were suppressed for political purposes. But as Mda shows through his omniscient first-person plural narrator, the community owns the story and it will not be silenced any more. The right to tell stories is one of the themes of this powerful gem of a novel. There is a communal reticence about the ‘ways of dying’ – because to acknowledge intra-Black violence is to provide the government with political ammunition. For decades successive White minority rule governments argued that apartheid was justified because the country would erupt into tribal violence without it. So victims are under pressure to keep quiet, especially since reporting Black deaths to the authorities doesn’t result in criminal investigation anyway. It all sounds rather grim, eh? But Ways of Dying is a love story, one that celebrates the triumph of the human spirit. It evokes hope, not despair. A short novel of only 212 pages, it is the story of Toloki and Noria, who – never having been childhood friends – are reunited in middle age. Toloki has had disappointments in his life, ones which would crush most of us, but he has created for himself a new profession which gives him a fragile dignity and an income which enables him to live frugally. He is a professional mourner, (somewhat like those in Liao Yiwu’s collection of stories, The Corpse Walker. See my review). With the tide of Black deaths rising, he has plenty of work. He has no bitterness about the hand that life has dealt him, and he does not despair, but he guards his heart with monasticism. At the funeral of a small child, he recognises the bereaved mother. It is Noria, from his home village. She has not only lost her child in unexplained violence, she has also lost all her belongings when her house was deliberately burnt to the ground. With grave courtesy he goes to pay his respects. A wild child in her youth, Noira is still beautiful, and despite his aloof nature Toloki finds himself attracted to her, not as a lover, but as a ‘home boy’. Toloki helps Noria to build another house. The sun rises on Noria’s shack. All the work has been completed, and the structure is a collage in bright sunny colours. And of bits of iron sheets, some of which shimmer in the morning rays, while others are rust-laden. It would certainly be at home in any museum of modern art. Toloki and Noria stand back, and gaze admiringly at it. First they smile, then they giggle, and finally they burst out laughing. Sudden elation overwhelms Toloki. Noria’s laughing is regaining its old potency. And then this middle-aged couple who have nothing – not even a stool to sit on – sit down in the one-room shanty they have built and, in the gathering darkness, ‘take a walk’ through it. They admire their comfortable furnishings, have a pillow-fight on the king-size bed, stretch out on the black leather sofa while they listen to music and watch idiotic American situation comedies on their wide-screen TV set. They then stroll through their luxury kitchen to the professionally landscaped garden beyond, taking in the fountains, pools and waterfall, smelling the scented flowers, and playing hide-and-seek in the bushes and shrubs like carefree children. This heart-wrenching sequence of magic realism ends with Noria and Toloki in ‘the dining-room’ where Toloki serves Noria with cakes on the silverware while he himself eats an austere meal ‘like the monks from faraway mountain monasteries’, in keeping with his self-invented Order of Professional Mourners. (Toloki has a mild but rather lovable tendency towards pomposity). Structurally, past and present interweave as the back stories are revealed, reaching a gut-wrenching climax when we finally learn the circumstances of little Vutha’s death. The omniscient narrator massages some aspects of this past (‘telling the story any way it sees fit’) so that the much longer-than-usual pregnancies and the gruesome deaths of Noria’s children are symbolic of the decades-long struggle for democracy in South Africa and the violence and suffering that accompanied the transition. Anticipating the Truth and Reconciliation Commission set up in 1995, Mda’s story stresses the importance of dealing with the unresolved past. Both Noria and Toloki left their villages because of conflict with their parents, and with comic genius Mda uses the character of the wealthy coffin-maker Nefolovhodwe to bring the tale to a satisfying conclusion. Nefolovhodwe is the inventor of the Nefolovhodwe Collapsible Coffin, which can be ‘carried by one person, like a suitcase, and it could be put together in easy steps even by a child’ so in one of many cunning ironies in this novel, he is the one Black man who has made a fortune from the epidemic of Black deaths. He cannot be content, however, until he has sorted out matters which trouble him from the past. Toloki notices that in every shack they visit, the women are never still. They are always doing something with their hands. They are cooking. They are sewing. They are outside scolding the children. They are at the tap drawing water. They are washing clothes. They are sweeping the floor in their shacks, and the ground outside. They are loudly joking with the neighbours while they hang washing on the line. Or they are fighting with the neighbours about children who have beaten up their own children. They are preparing to go to the taxi rank to catch taxis to the city, where they will work in the kitchens of their madams. They are always on the move. They are always on the go. The narrator wryly observes that Toloki’s tentative observations derive from his monastic lifestyle, having lived apart from other human beings, for he would surely otherwise ‘assume that it was normal for things to be like this, for surely this is how things were meant to be from day one of creation’. Toloki doesn’t understand why it is that all the grassroots community leaders are women but all the national and regional leaders are men, except for one bejewelled wife of a very important man. Oh, and one other subtle ‘little’ thing: Noria and Toloki are from the same village but of different races. Their skin colours are different. Having discovered this author via The Africa Book Club I have now ordered his Heart of Redness, which won the Commonwealth Writers Prize for Africa in 2001. I can’t wait to see how good that is too. I enjoyed reading your review of Zakes Mda’s Ways of Dying. I’ve wanted to read a novel by Mda but haven’t gotten around to it. I plan to buy and read Mda’s novel, Heart of Redness, in the near future. Mda’s most recent and lengthy publication- Sometimes There Is a Void: Memoirs of an Outsider- has received favorable reviews. There is an audio interview with Mda, ‘On Point: A South African Journey through Words,’ by Mike Pesca on youtube. I think There is a Void is the one set in America, where he has been a visiting professor? I’ll be interested to try that one too, to see how the different setting works out. I” certainly check out the YouTube interview, thanks for letting me know about it. PS Where are you studying this book? I’m a sophomore at Northern Michigan University and I’m taking a 300 level South African World Cultures English course, one of the many books we’ve read this semester. I know you’re busy writing that essay, so I won’t pester you with questions, but if you ever have time after it’s done, do come and tell me more about the course: I’d love to know what other books they’ve recommended for you to read. There are some books by South African writers that have been brought back in print by the independent publisher, Waveland Press, in the U.S. Bessie Head’s short story collection ‘The Collector of Treasures” and novels ‘Maru’ and ‘When the Rain Clouds Gather’ are now available. There are also African writers from other regions whose books bear merit are also back in print such as Alifa Rifaat’s ‘Distant View of a Minerat and Other Stories’, Mariama Ba’s novel ‘So Long a Letter’, Flora Nwapa’s novel ‘Efuru’, and Buchi Emecheta’s novel ‘Kehinde’. The diversity and richness of novels, plays, memoirs, and poetry by African writers are blooming. What would you like to know? Aside from Ways of Dying, we’ve read “A Human Being Died That Night,” by Pumla Gobodo-Madikizela, The Colonizer and the Colonized (Memmi), Cry the Beloved Country, Waiting for the Barbarians, etc. I can probably get back to you quicker if you email me @ corkin02@gmail.com. It’s a difficult but interesting class. Thanks, Drew, I’ll add those ones to my wishlist! So you’re a philosophy student? or political science? Sounds excellent Lisa. I need to read more AFRICAN literature, particularly about that period and post-Apartheid, and particularly by non-Anglo African writers. Well, this is one of the best. I really miss the reviews that used to be on Kinna Reads, she seems to be doing other things now, so I don’t tend to hear about the recent releases. Which is a shame because there’s great writing coming from places like Nigeria and Ghana in particular.